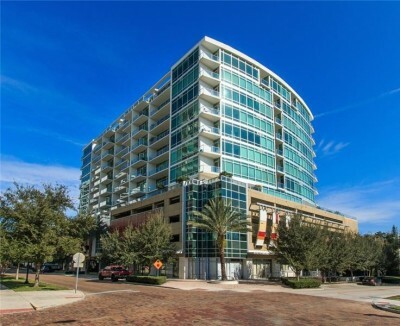 101 Eola is an upscale, high-rise condo located in the heart of Downtown Orlando‘s South Eola neighborhood. The residences are some of downtown’s finest, with floor-to-ceiling windows, large outdoor balconies, and stainless steel appliances. 101 Eola condos for sale also feature tumbled marble backsplashes, granite countertops, 10-foot ceilings, and more. Built in 2008, 101 Eola is one of the few Downtown Orlando condos that are FHA approved. The 101 Eola condo tower’s 12 stories consist of 146 units, 8 of which are penthouses, and it’s just 2 blocks from the city’s centerpiece – Lake Eola! Residents of 101 Eola Downtown Orlando condos have access to the 5th floor amenity deck, which includes: a resident lounge with indoor and outdoor seating, a resort-style pool, sun deck, hot tub, sauna, and steam room. There’s also an outdoor bar and grill area, plasma TV’s and free WiFi in the business center, a state-of-the-art 24-hour fitness center, concierge services, and a pool table. 101 Eola condos are conveniently located to restaurants and retail space on the ground floor. 101 Eola condos are nestled among the tree-lined and brick-paved streets of Downtown Orlando’s neighborhood of South Eola. Residents have easy access to local street-side bistros, chic dining, unique boutique shopping, and a quaint European ambiance. 101 Eola condos for sale are just a short walk from Thornton Park and Downtown Orlando’s Central Business District. open floor plan perfect for the urban dweller. Looking for your new condo in Downtown Orlando? Find 101 Eola condos for sale & Downtown Orlando real estate in 32801 here! Feel free to call us with any questions you may have about buying a condo at 101 Eola in Downtown Orlando. Ready to sell your 101 Eola condo? Call us today at 407-237-3331 for an accurate, up-to-date, and FREE home valuation! Let’s get your condo sold!